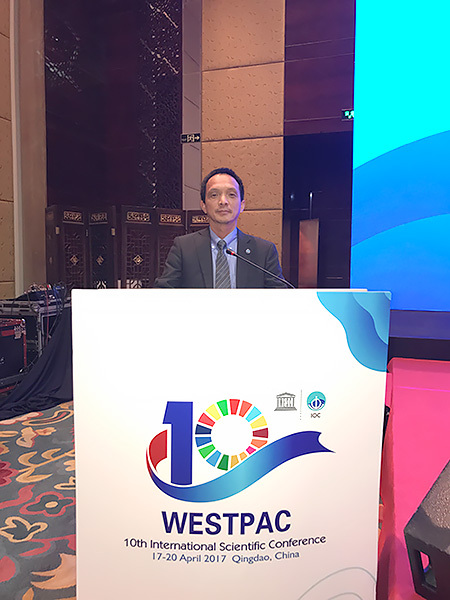 At the 11th Intergovernmental Session of the IOC Sub-Commission for the Western Pacific (WESTPAC) of the Intergovernmental Oceanographic Commission of UNESCO (UNESCO/IOC) (*) (21-23 April 2017, Qingdao, China), WESTPAC Member States held the election of WESTPAC officers, and elected Dr. Kentaro Ando, Group Leader of Ocean-Atmosphere Interaction Research Group, Research and Development Center for Global Change of JAMSTEC, to a Vice-Chairperson of WESTPAC. It was the first time in seven years that Japanese expert was elected as a WESTPAC officer since Professor Yasuo Fukuyo, the then Professor of the University of Tokyo, was elected as a Vice-Chairperson of WESTPAC in 2010. WESTPAC is a regional subsidiary body established in 1989 by the UNESCO/IOC to promote international cooperation and to coordinate programmes in marine research, ocean observations and services, as well as capacity development in the Western Pacific and adjacent seas. WESTPAC currently consists of 22 Member States mainly in East Asia, Southeast Asia, South Pacific and the eastern Indian Ocean. WESTPAC office is based in Bangkok, Thailand. Japan has actively been involved in and contributed to WESTPAC activities, including through the utilization of Japanese Funds-in-Trusts (JFiT) provided for UNESCO as well as by the participation of Japanese scientists in relevant activities. Dr. Ando will serve as WESTPAC Vice-Chairperson for approximately two years from 23 April 2017 until the end of WESTPAC’s 12th Intergovernmental Session planned in early 2019. (*) The Intergovernmental Oceanographic Commission of UNESCO (UNESCO/IOC), established in 1960 as a body with functional autonomy within UNESCO, is the only competent organization for marine science within the United Nations system. The purpose of UNESCO/IOC is to promote international cooperation and to coordinate programmes in research, services and capacity development, in order to learn more about the nature and resources of the ocean and coastal areas and to apply that knowledge for the improvement of management, sustainable development, the protection of the marine environment, and the decision-making processes of its Member States. The UNESCO/IOC Secretariat is located in the UNESCO Headquarters, Paris, France. UNESCO/IOC currently has 148 Member States.